Aimee Nezhukumatathil is a professor of English at SUNY Fredonia, where she teaches creative writing and environmental literature, and is the author of three poetry collections: Lucky Fish (2011), At the Drive-In Volcano (2007), and Miracle Fruit (2003). 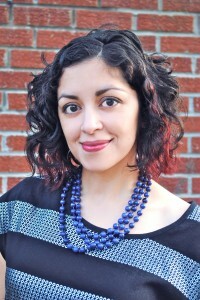 For her work, she has received several honors and awards, including the Tupelo Press Prize, the Balcones Prize, a Pushcart Prize, and a fellowship from the National Endowment for the Arts. The editors of The Journal are pleased to announce that Nezhukumatathil is serving as this year’s poetry judge for our second-annual genre contest, which will be open for submissions on April 1, 2013. Recently, she spoke with The Ohio State University MFA student David Winter about her own poetic origins, her interest in science and fable, and her balancing act between writing and motherhood. David Winter: I’m struck by the playfulness and accessibility of your poems. As a reader, I often feel that you invite me to experience amazement and bewilderment in ways I don’t expect. What do you do to keep the experience of poetry—for yourself and your readers—new? Aimee Nezhukumatathil: Thanks so much. I guess the easy (but true!) answer is that I myself have a short attention span and even though I think the cardinal sin of the poet is to bore the reader, the truth is I don’t want to bore myself. Even if I’m writing about a town or, say, a reptile I adore—I very much am always looking for ways to surprise myself and try to “make it new.” And to do that, I read and read and turn ideas over in my head or in a notebook for weeks or months at a time before I ever begin the “making” or drafting of a poem. DW: I am sincerely impressed by anyone who manages to parent and write at all. There are several poems in Lucky Fish that deal with pregnancy and motherhood, and I read in another interview that you’re working on a book of poems for young people. Could you talk a little bit about how motherhood may have influenced or informed your work? AN: I love that you asked this very good question, but it’s hard for me to come up with a solid answer because my oldest son is five and my youngest is two-and-a-half. For me, motherhood has been a joyfully slippery whirl—I feel like each day has its own specific answer, so I’ll leave it to others down the road if they want to draw comparisons to my earlier poems. But I can say that when I sit at my desk to write, there is a sense of urgency and a deeper sense of gratitude and celebration for this planet and its inhabitants. I know that my heartbeat is closer to the surface of my skin, so news about hate and violence affects me more than ever before, and I can’t help but feel sometimes that the only way I can push back against all this darkness in the world is to find ways to record instances of delight and beauty on this planet for my sons. DW: You are a tenured professor, but I understand that you have also worked extensively with younger writers outside of academia. My own writing students have often shown me new ways of reading familiar texts and new ways of understanding my own poems. Has teaching influenced your approach to writing? AN: Oh, most definitely! For me they are one in the same in that when I first came to poetry in college, I was also reading extensively outside of class, trying to play catch-up with my very well-read peers. In effect, I was teaching myself first, for example, how to write a sestina or villanelle, so that I could come back to workshop the next week and feel confident enough to contribute to class discussion about a classmate’s sestina when, at the time, I had only just recently taught myself how to write one. And I always remind my students that “poems are not frogs.” That is, we’re not going to dissect them until all that is left are some unappetizing bits of skin and bone, and yet we need to at the very least check the poem’s heartbeat, see if it is as healthy as it can be, and, of course, along the way, recognize that there are several versions of what it even means to be “healthy,” to extend that froggy metaphor. DW: I love this metaphor of the poem as a living thing that should be kept healthy rather than violently dissected. I think that many of us have trouble treating our own poems that way, even when we are able to be humane or holistic in our criticism of others’ work. Do you have any advice about revision? AN: Ah, revision—that’s the fun part of writing for me actually. Now the drafting process is very unglamorous for me—lots of self-doubt, stops and starts, fussing over lines, stress-eating gummy bears (I’m only half-kidding)—but I think you have to push through distraction and just get it on the page, even if it means wading through the mucky swamp of doubt. I never know when I’m going to be able to return to the desk again. At the risk of being a tad melodramatic, I confess that at the end of every draft, I’m actually physically tired, spent. But I love and live for revision! Love it. That’s where the making and shaping joy and play and music-popping-crackle metaphor-magic and the snapping off line breaks happens for me. I think that helps keep my students in check when at first they may resist looking over their poems again. I ask/tease/shame them: How can you NOT love revising poems? That’s where the magic happens! As for specific advice—I usually start with examining the openings and closings of the poem: the first line of the poem should hook just under your skin to keep you wanting, really wanting, to read on. The last line should feel as if the hook were either yanked out or gently removed. Either way, it should smart. DW: Both folklore and science permeate your writing, not only as content but also as formal influences. In Lucky Fish, for instance, you structure one poem as a set of magical amulets and another as a natural history, while a third seems to combine the language of an exhibition with a fable. How do science and superstition feed into your creativity, and how do they help you to make sense of the world or move through it? AN: Great question. Myth, folklore, science, natural history—these are the subjects of books that I was drawn to for as long as I can remember. Sure, as a little girl, I devoured the usual Amelia Bedelia and Beverly Cleary books, but it was actually books on minerals and birds or shell guides that most often filled my library book bag. I also teach environmental literature, and these days I read as many science and natural history books as I possibly can, so my vocabulary and the structure of how I organize my writing has long been in place before I ever knew what it was to write a poem or essay. I learned how to make sense of the world and my little heartbreaks and desires through a language of science and fable. It was the only way that I could find to marry all the wonder and beauty and danger that I witness in this world—though I will happily say that, when I use the diction and structure of myth and fable, I try to make it very obvious. And when I reference something from the natural world, the reader can be assured that much care has gone into researching that little factoid (like interviewing a marine biologist in person at the Monterey Bay Aquarium to learn about the exact pulse of a moon jelly, for example)—that all scientific details in my poems and essays are true and not me just waving my poetic license around. DW: I loved what you said about “a language of science and fable” being the only way that you could marry your different experiences of the world. But a lot of people think of science and fable as being opposed to each other. For instance, part of the disagreement in our current debate over global warming is between those who base their views on scientific evidence and people whose views are shaped by very literal interpretations of scriptural stories. While I think the marriage of these two elements in your work is extremely attractive, I also wonder if you have any thoughts on this perceived conflict between science and fable? Isn’t that so beautiful? I think the ability to have a situation and a specific vocabulary to create a new world on the page is true to some extent for most writers, isn’t it? DW: What is a recent book that excited you? What books have you returned to again and again? AN: What’s recently floored me was Sharon Olds’s newest collection, Stag’s Leap, and Tarfia Faizullah’s Seam, a first book that just won the Crab Orchard Prize. I return to any of Lucille Clifton’s poems again and again. Her Collected Poems from BOA sits on my writing desk right now. I always return to D’Aulaires’s Book of Greek Myths—I’ve been in love with the delicate colored pencil illustrations since I was seven or eight, and I’m not embarrassed to say that volume still brings me great joy. DW: Thanks so much for taking the time to answer these questions. It’s been a real pleasure to learn a little more about the roots of your poetics and the person behind the poems. In closing, I wonder if you would leave us with a few words about what first drew you to poetry? Do you remember writing your first poem or a particular moment when you first knew you were a poet? AN: Growing up as one of the only Asian-Americans in most of my school always set me apart, always observing. But my parents fostered a sense of being grateful and amazed and wanting to always be curious about the world and its inhabitants, so I never truly felt alone. I can remember my father taking me and my younger sister on a hike in the mountains that form one edge of a ring around the Phoenix suburbs, pointing out the names of each of the various cacti and desert flowers that we encountered. We’d stop and find quartz crystals or geodes hidden on the trails: such treasures! Saguaro, ocotillo, yellowbell, shrubby bulbines, chuparosa—just try to say those names out loud without smiling. So there was never a light bulb moment for me in terms of figuring out who I was. Rather, it was in college, right inside Ohio State’s Denney Hall, where I learned there was a whole craft and study of how to clearly and musically communicate and record the world around me. In many ways, even though I’ve just recently been promoted to full professor here at SUNY-Fredonia, I hope that I never ever stop being curious and feeling like a student on this planet. There are always insect wings and jellyfish bells to marvel over. I still need to learn the color names of glaciers—so much bounty and life that I want to record on the page.